Do you tend to head back indoors once the sun has gone and the garden has gotten dark? You shouldn’t have to! Create a magical and atmospheric mood in your garden that will make you want to relax outside for hours after the sun has set. From the small garden table lamp to the decorative light objects - Find the right light for any purpose easily at Connox. A day in the garden, that means: Putting your feet up, reading a good book, barbecuing with the family and enjoying the fresh air. Whether you spend your time in the garden sunbathing or taking care of your flower bed - the garden offers everyone a relaxing break from the daily routine. Just because the sun has set does not necessarily mean the end of this special day. With the right garden lights, you can enjoy your green oasis, even once it gets dark. The weatherproof lamps not only ensure safety and orientation in the dark, but they also create a wonderfully cozy atmosphere from the patio to the garden house - and in most cases, without the need for a power source. Innovative rechargeable LED lamps and solar lights have taken over gardens, not only because they're decorative, but also because because they're environmentally friendly. Discover how you can brighten up your garden and what you should consider before purchasing a garden lamp. 2. How Does my Garden Lamp Operate? 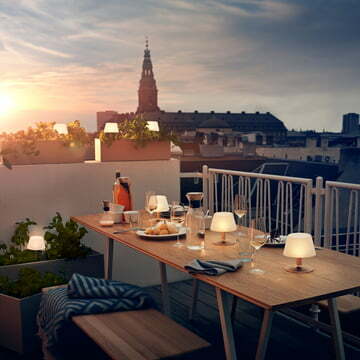 Being out on the terrace on a warm summer evening, drinking a glass of wine, eating together or playing a game of cards with the family: Garden lamps make this possible. Whether it is placed on an outdoor table or on the lawn - an indirect light offers a decorative glow creating a cozy atmosphere and stylishly shows off your plants. Even when it’s too cold outside and you spend the evenings in the house, the lamps offer a beautiful, wide view off your garden. Targeted ceiling and wall lights illuminate the entrance and facade, being especially handy when you come home in the dark. Spotlights light up paths and driveways. Whether for decoration or orientation in your garden, there are different versions for many different purposes. 2. How Does My Garden Lamp Operate: Battery, Solar & Co.
Rechargeable LED Garden Lights: Rechargeable LED lights are usually equipped with permanently installed LEDs, which are charged via an integrated rechargeable battery. Therefore, they can provide mood lighting in the outdoor area for several hours. No need for cables or power sources, the rechargeable LED light can be placed anywhere. Moreover, they are robust, particularly energy-saving and last for up to 100,000 hours - thus, they are environmentally friendly. Thanks to its three levels of brightness, the Balad rechargeable LED lamp by Fermob always provides the right lighting in the garden and can be recharged via USB cable. It also features a handle, making it easy to transport and can be placed next to the entrance of the garden or hung on a tree branch. Solar Lights: Garden lamps that operate with solar energy are the most environmentally friendly methods to illuminate the garden. The integrated solar cells recharge during the day thanks to the sun and produce decorative lighting in the evening. After a day in the sunshine, solar lights produce light for up to an average of 20 hours. Much like the battery LED lights, solar garden lamps are cordless and can be set up wherever you choose. Their brightness and duration depend on the intensity of the solar radiation; however, they require no electricity and save both money and the environment. The SunLight Bell Solar Lamp by Eva Solo comes with integrated, invisible solar cells. Thanks to its bell shape, it can be placed anywhere or hung up using the loop on the top. Electrically Powered Outdoor Lighting: Garden lamps connected to a power supply ensure a sufficiently bright and permanent lighting by simply pushing a button. Ceiling and wall lights which are used for safe orientation often operate electrically. Their purpose is to reliably illuminate the entrance area as well as the facade, so a strong light is needed. In addition to halogen and energy saving light bulbs, energy-efficient LEDs are also becoming more and more popular, considerably reducing the amount of electricity used. Another tip: LED lights without infrared and UV radiation attract considerably less insects. As a general rule: Lighting placed in the entrance area and under the canopy should have an IP protection of at least 23, so that they are protected against water sprays. External wall lights must be IP44 water splashing protected. Garden lamps that are placed in the open air must be waterproof and thus IP67. Refer to the respective product pages for detailed information about the IP protection classes of the lamps. Tailored to the various outdoor purposes, garden lamps come in a wide variety of designs. To provide a warm atmosphere when eating out on the patio, you can select several small garden lamps. 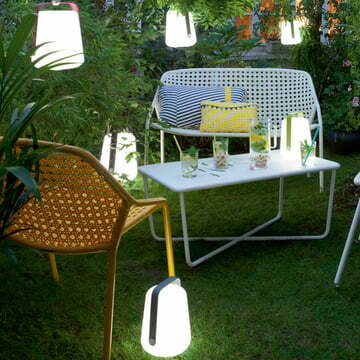 Small garden lamps for the table and ground lights radiate a warm light atmosphere in the blink of an eye. The LED Cube by Moree serves as a seat, a table, a decorative object, and an indirect light source - a versatile and atmospheric eye-catcher in any garden. If you're looking for a romantic mood, set up a solar pendant lamp, that is hung up in a tree above the garden table or on the balcony. Stylishly highlight individual plants, a green-covered ivy wall or free-standing trees with an LED spotlight or a clip-on lamp. A ball light placed on the lawn or an illuminated flower pot take on a decorative purpose to create a magical atmosphere. Outdoor lamps with motion detectors are ideal for the entrance, the carport or the garden house, like the battery-powered Spylux LED multi function light by Osram. Thanks to the magnetic setup, the lamp can be removed at any time and used as a practical flashlight. Bollard lamps, that are positioned at short intervals along the way, ensure enough lighting over the entire surface. So there is no risk of tripping over footballs or bumping into steps in the dark. Thanks to the graduation of the light, the garden lights also structure the garden and give it space. Garden lamps with ground spikes can also be used as path or terrace lighting. You can easily change the position of spike lights when necessary. The seating area in the garden should invite you to relax and have get-togethers. To create a harmonious lighting atmosphere, you should have a look at garden lamps that produce warm and gentle light. For this purpose, there are warm white lamps and outdoor lamps that radiate indirectly and diffuse light. The same applies for garden lights that serve a primarily decorative purpose on the lawn or on the terrace. Spotlights, that emit direct light and illuminate paths or single plants, require a brighter bulb in neutral white. For ceiling and wall lights, you should also select a neutral or daylight white light source. This ensures sufficiently bright lighting in the entrance area and will help you find the door without tripping over anything. Battery-powered, dimmable table lamps such as Edison the Petit by Fatboy are affordable and do not cost much. In the medium price range, you can find garden lamps from renowned manufacturers such as Artemide and Fermob. Especially large and original lighting objects such as the Lounge Variation by Moree will be in the higher price range. With our tips, you can easily find the ideal garden lamps for the outdoor area. Now browse the shop and find your dream piece! You want to buy a garden lamp but need help? Feel free to contact our customer service team at any time. We are happy to help and give advice, make recommendations and resolve any issues quickly and efficiently. Have your favorite items delivered straight to your home!